So far, only "Configuration" has been explained. Additional chapters to be followed. With the help of this configuration window you can change the way the files are interpreted. Additionally the text color of words (e.g. signal words) can be changed. You may have noticed that line 1 and 8 didn't contain the last part (beginning with | ). Also the line 7 beginning with ; didn't exist. Now let's assume which delimiter configuration may be useful for this kind of structure / pattern. In the example file above lines 1 and 8 have something in common. Our goal is to extract the three words of this identifier line: GROUP_A, FirstElementA and Appendix1. 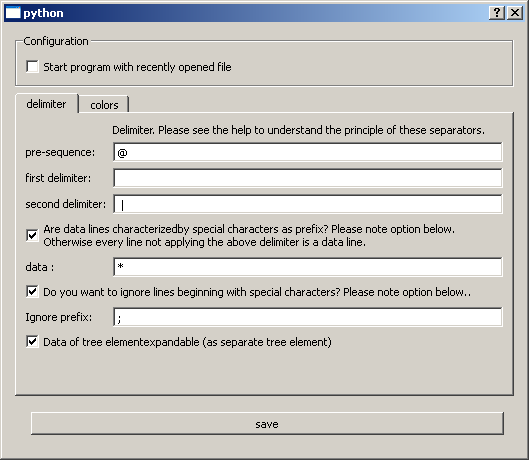 Therefore delimiter cannot contain one of these characters because the program might not recognize this delimiter (because it is part of the word). The exact definition of a word is required because regular expressions are used to find identifier lines. The " | " (blank|blank) separates the second from the third word. After you've chosen this as second delimiter, Appendix1 will be taken as second word of the identifier line. Now all three words are covered. The program will show uncovered lines after the import process in a remainder list window. This helps you to adjust the delimiters. 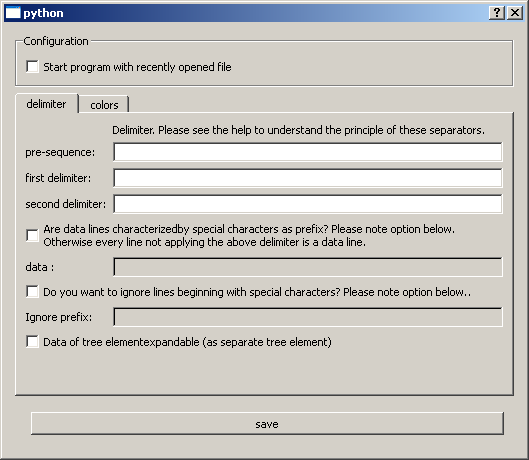 Select the checkbox "Are data lines characterized by ..." when data elements begin a with special prefix. After the checkbox is checked, the line below is editable and the prefix (in this case *) can be entered. From now on, only lines beginning with this prefix are treated as data lines. Other lines (which are no identifier lines) are ignored and listed in a remainder list window after the import. It is also possible to uncheck this option and the prefix won't be considered. When the prefix isn't used (unchecked option), all lines are treated as data lines, except the one probably configured with ignore prefix (see chapter 1.3 Ignore prefix). These comment lines will be ignoed by selecting the checkbox and inserting a semicolon (;). 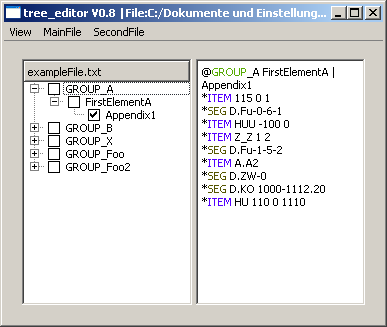 The data lines can be displayed in the editor of the corresponding selected tree elements or as child tree element of the corresponding tree element. Use the checkbox "Data of tree elements ..." to configure your desired behavior. The first picture shows the main window with data and the second one with data as tree elements. 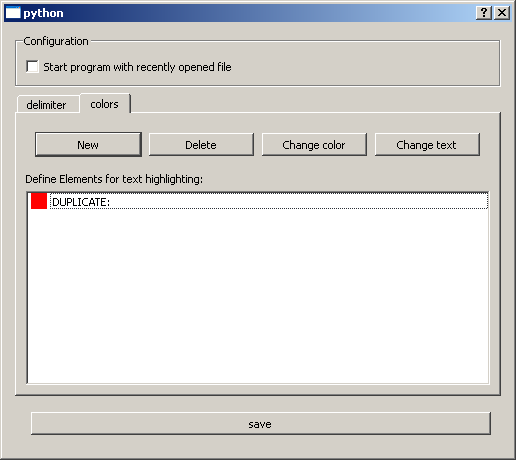 Words of the editor can be highlighted. Add a new entry to the list, where black is the default font. Use the appropriate button to change the color of the selected entry of the list. Other buttons make it possible to change the text or to delete the selected entry of the list. The red DUPLICATE: is a default value which will be used in a report shown up after the import process of a file. It can be deleted. 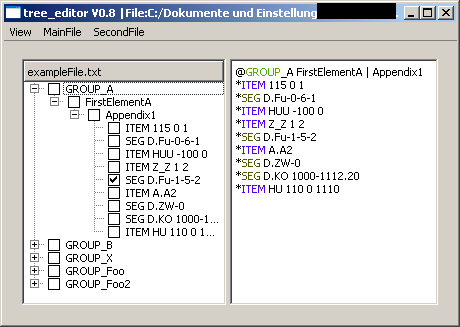 Highlighted words can be seen in the pictures of chapter 1.4 Data as expandable tree elements. The following values can be used for the given programs. Please send me the values of your configuration and the program to use for via e-mail (see contact page). The option of chapter 1.4 Data as expandable tree elements should be disabled for files over 1 MB because it takes to long to import.